Greenwich  is a district of London. 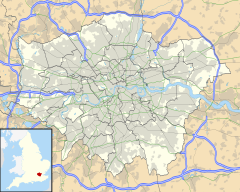 It is in the Borough of Greenwich, about 8.9 km east south-east of Charing Cross. The Royal Observatory there is the basis for the Greenwich Meridian (0° longitude) and Greenwich Mean Time (GMT). Greenwich is a town with a long history. It became the site of a royal palace, the Palace of Placentia, from the 15th century. This was the birthplace of many members of the Tudor dynasty, including Henry VIII and Elizabeth I. The palace became ruined during the English Civil War. It was rebuilt as a hospital by Sir Christopher Wren. These buildings became the a military college in 1873, which lasted until 1998. The town became a popular resort in the 17th century. Many rich houses were built there, such as Vanbrugh Castle (1717). Estates were built above the town centre. Greenwich was part of Kent until 1889 when the County of London was created. Maritime Greenwich is a UNESCO World Heritage Site. It is on the River Thames. The site includes buildings along the riverfront, and surrounding the 17th century Queen's House. The group include the complex of the Royal Hospital for Seamen, the Royal Observatory and the Royal Park. The Royal Hospital was laid out to a master plan created by Christopher Wren. The hospital complex was built over many decades. Other architects who added to this long-term project included Nicholas Hawksmoor. The core of this group of buildings is the Queen's House which was designed by Inigo Jones. This was the first Palladian building in Britain. The Royal Observatory is now the baseline for the world's time zone system and for the measurement of longitude around the globe. The Royal Park is a symmetrical design in an irregular landscape around the buildings of the World Heritage Site. The park was created by André Le Nôtre. The park and grounds behind the buildings on the river held the competitions for the horse-related events of the 2012 Summer Olympics. National Rail and Docklands Light Railway services call at Greenwich station. ↑ 5.0 5.1 5.2 5.3 5.4 UNESCO, "Maritime Greenwich"; retrieved 2012-4-19. ↑ These buildings became home to the Royal Naval College from 1873 to 1998. ↑ London 2012 Olympic and Paralympic Games, "Greenwich Park"; retrieved 2012-4-25. Wikimedia Commons has media related to Greenwich. This page was last changed on 5 April 2019, at 13:57.